Atlantis had more variation in color when I had it. Leaves had a mix of yellow and pink in sort of vague striations. Think these are the same plants I gave to Immortal a while back? It was pretty but leaned bad so I didnt like it. That was during a period of really high ferts and several things were getting their lean on. Funny thing is lowering ferts straightened a lot of things up. Mermaid weed, L rubin and cuba especially. I am convinced the Atlantis is the same as the repens I already have going. Hoping for that variegated leaf type pattern but not. Not an aquarium type weekend by any means. Back @ it again tomorrow damn near all day. Managed to make some RODI water today though. Plants are clean and growing well. The new blessing is the ability to just yank stems and not worry about dirt. Tomorrow eve a little bit of trimming and I'll have to get some pics too. The plant density is off the hook! At one point I would have sworn on the capped soil. Now I am not so sure, BDBS is growing everything just as well. Am I better @ the dosing and predicting, who knows! Some mermaid weed @ it's prime, still rather short but on it's way. Polycarpa as always at a good stage! Parrot feather looks sharp and aromatica going strong! Much trimming is needed and looking like most will be trashed this go around. Greggz, vvDO, burr740 and 4 others like this. MG that is some farm you have going there. Your uptake of nutrients must be through the roof. Must really have an effect on fert dosing, and is another balancing act. Honestly makes my tank look bare in comparison, but I need room for the Bows to roam. When you changed substrates I wasn't sure what to expect, and am glad to see it appears to be going very smoothly for you. Someone is interested in a small sale, so a little breathing room coming. Not a tough balancing act @ all. I posted about consumption before. 3ppm NO3 & .015ppm Fe consumed daily. and weekly I dose micro to bring water column up to .3ppm Fe. Use two tests weekly and I just dose it all the same day. I'm not done with dirt, have another bucket fermenting for 4 months now. Greggz, burr740, Immortal1 and 2 others like this. I'll grab a FTS tomorrow, seen these messages after lights out. TBH the bottom of the tank looks like Holy Hell! Many plants are in ceramic plugs and just farming is going on. I've spent a few too many years growing and selling. Truly want a "Dutch Scape/Fruit Stand effect but not quite ready. Greggz, ipkiss and Immortal1 like this. A nasty full tank washed out shot. Trimmed a lot last night, 75% was reaching the surface. Handfuls went to the trash, mostly bottoms. Nowhere to keep them to let them branch and grow. 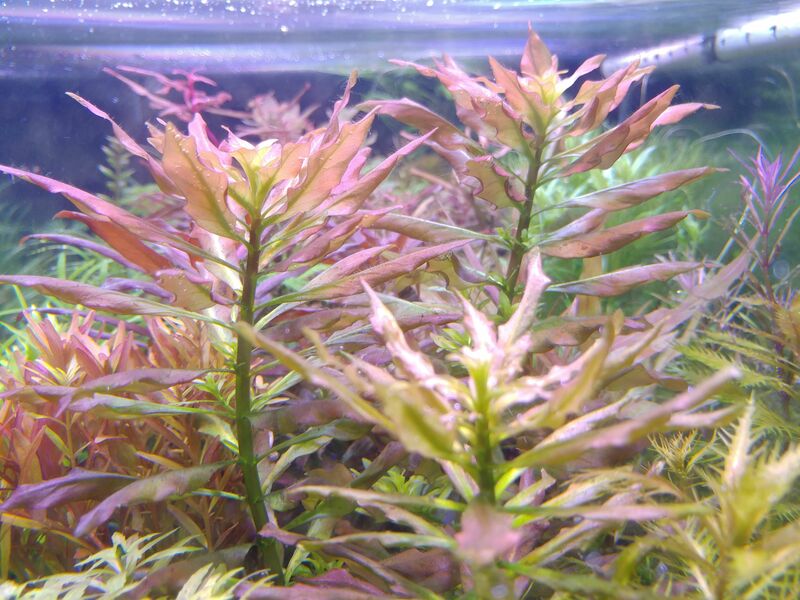 The growth and color difference between a 75PAR tank and a 120PAR tank is extreme. 75PAR in my 33G that is the catch all for extra plants. Myrio red stem and parrot feather are competing for the fastest grower. It has to be over an inch a day, time lapse photography would be interesting. 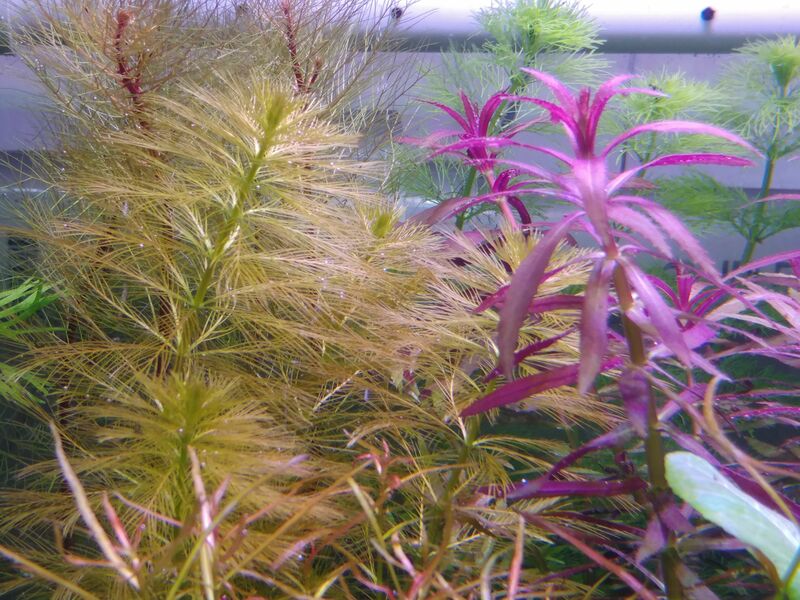 I'd be willing to part with the red stem myrio but the parrot feather grows amazing tops and quite colorful. Polycarpa has been a large colorful plant these days. About 5" in diameter. 3 left in the 80G. Greggz, vvDO, ipkiss and 4 others like this. 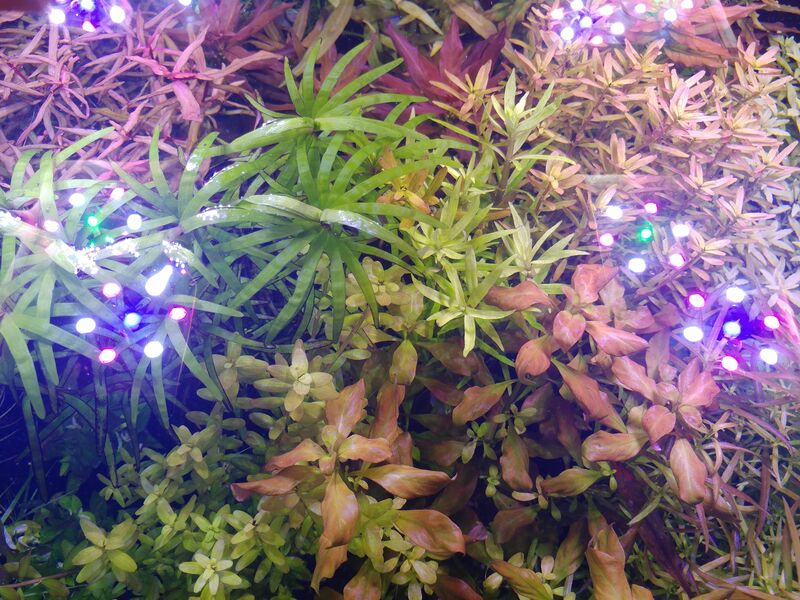 Plugs aside, the assortment of colors and textures on the FTS are pretty impressive. It's time for the fruit stand my friend! You have all the species you need. I am very much looking forward to it. Maryland Guppy and Immortal1 like this. whaat? that FTS is pretty awesome. plugs and all. I love it. This really impresses upon the viewer the sheer immenseness of the collection. plus, remember who ya talkin to. you've seen my hot mess of a tank and I don't even have an excuse for it! Greggz, Maryland Guppy and Immortal1 like this. About 8" came off the bottom of the Atlantis. Now it's a bunch of 4" tall plants in a plug. It does look a bit different than the broadleaf, more time needed. I could write a novel about many of these plant species. What grows them the best, what may possibly stunt them etc..
Just don't have the time required to journal all of the info. Plus it is only 1 perspective of the growth habit of any species. I'm having fun and enjoy the growing part of the hobby! Ah the fruit stand part! I've watched lots of plants grow. Used to always think that L.cardinalis would be the "street" for me. 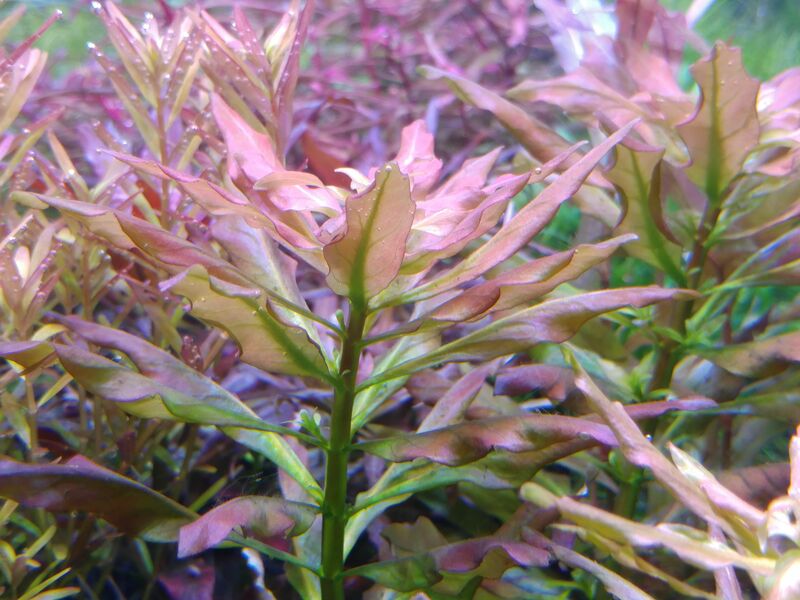 This stuff still grows a foot tall in my tanks, or I don't prune it enough! After seeing the mini aromatica without soil I've changed my mind. The mini came from you quite some time ago. I have discovered over time that the single most advantage is changing the water parameters. 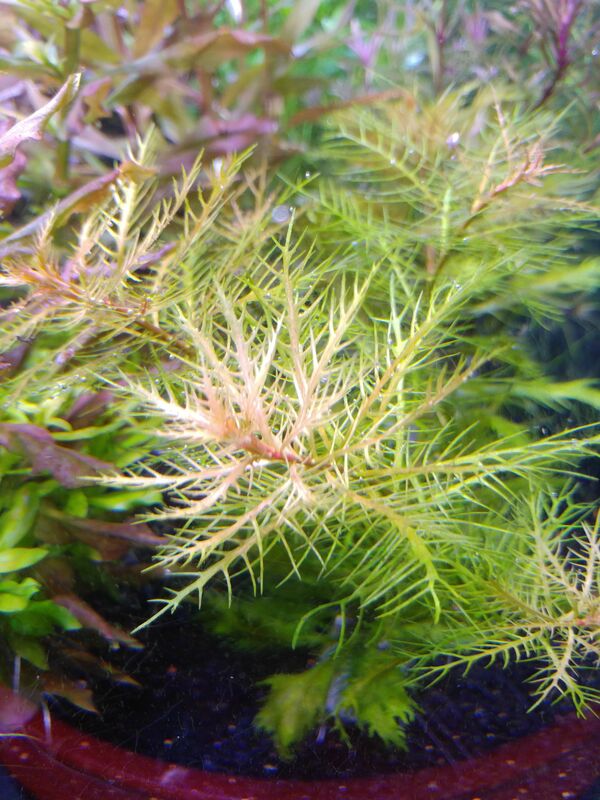 Place a plant in a different tank and the top stunts(sometimes not) and creates many new branches. This works for many species! I like the plugs! It kind of reminds me of the exciting promise of seedlings at the garden center in the spring.